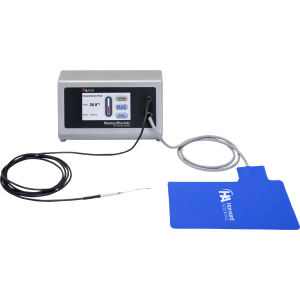 The Homeothermic Monitoring System is a closed loop temperature control system for small rodents. Utilizing a small, flexible rectal probe to monitor the animal's core temperature and a heating pad to provide heat input, the subject's core body temperature can by accurately controlled. The system is provided complete and includes the control unit, flexible rectal probe, standard size heating pad (12 x 20.5 cm), and an insulation pad. The easy to use touch screen allows users to set the target temperature and clearly view the subject's current core body temperature, as well as the set temperature, at all times. Additionally, audible alarms can be set to advise the user should the animal's core body temperature deviate �1� from the set temperature. Heating pads are available in three sizes to git all your surgical needs. The standard size is appropriate for mice and rats and fits nicely into standard stereotaxic instruments. Two additional sizes are avialble to fit the common stereotaxic instrument adapters. The pads are flexible enough to fully wrapt the animals, which allows the animal to be warmers from all sides rather than just the front or back.